In 2014 Gill set up GillyMac Designs to teach local children and adults to sew. Gill quickly won national awards with her children’s classes and was recruited to teach classes for Liberty of London and works nationally for the Quilters Guild of the British Isles. Gill’s work has been shown around the UK as part of the GENArt movement, including being exhibited at the Turner Contemporary Gallery. Over the past 5 years, Gill has expanded GillyMac Designs to four adult weekly classes and three weekly teen classes and the much loved Junior Sewing Bee. Other classes are developed and fitted into this busy schedule. Gill has also grown a large vibrant online community on Facebook and Instagram as well as setting up the online GillyMac Club for all her pupils to join and continue to share their work and learn from Gill regular online sewalongs. For 2019 Gill has created new online classes accessible to all, which are taught in the same relaxed, informative and genuine style. Gill’s ambition for GillyMac has always been to deliver world-class teaching in an accessible local and online environment. 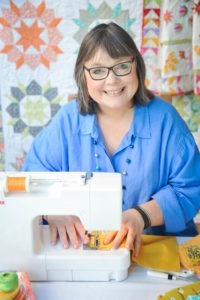 Gill is an active member of the Quilters Guild of the British Isles, of the Modern Quilt Guild and each year supports the development of sewing as a skill for the charitable Duke of Edinburgh Awards program.